This year marks the fifth anniversary of Steins;Gate in Japan. 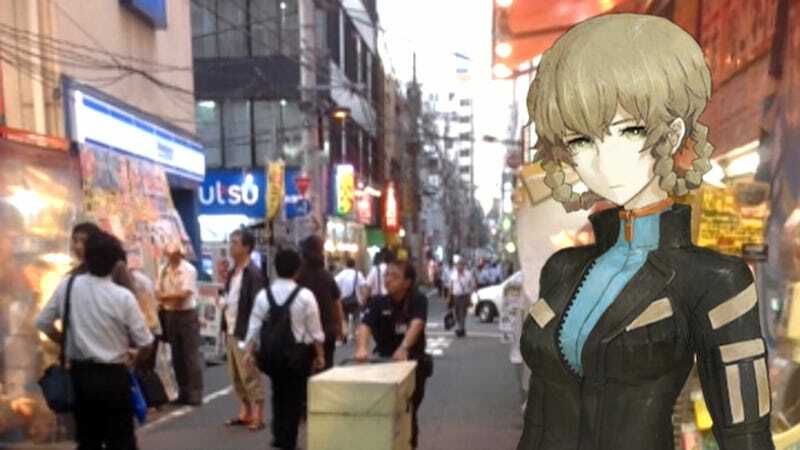 As part of the celebration, a free augmented reality game was released for fans visiting the game’s location—otaku mecca Akihabara. So, of course, I decided to head over there and play it. Steins;Gate AR Rally uses the free iPhone/Android app Furatto Annai to direct you to certain GPS locations on a “stamp rally.” The program gives you 13 locations around Akihabara and then, using a classic radar-like screen, you try to locate each one. When you get close to one, your phone vibrates and hints appear on the screen to help you hone in on where exactly you are supposed to look to find your Steins;Gate AR object—which you then take a picture of. Right outside of the station, my phone buzzed me about a nearby object. The hint told me to look up. Still couldn’t seem to find it—until I looked straight up. Then, I took the picture. One down and 12 to go. The next locations were on the IDX building, a place seen many times in the series, where I found Kurisu and Faris. From there, I went to one of the most importance places in the series: a set of lockers that once contained an important object. And an often visited shrine. Sadly, not all of the locations I visited for the rally were directly related to Steins;Gate, though they may end up in the upcoming Steins;Gate 0. Still, it was great to see the places, some of which I’d only seen in the game, over the course of an hour-long hike—even if summertime in Japan makes everything outdoors kind of horrible. Steins;Gate AR Rally was released on July 28, 2015, for free on the iPhone/Android app Furatto Annai.